On sunny and/or windy days (and there are plenty of them), we get most of the electricity we need during the day directly from the solar panels and wind turbine. Any excess electricity we generate beyond what we use, is stored in batteries located in the crawlspace under the cabin. We then draw from the batteries at night, or when there is little sun or wind. 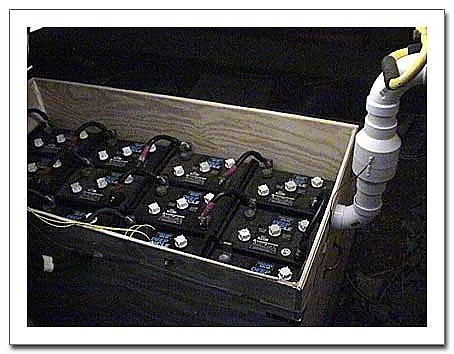 The batteries are in a plywood battery box I built. It is about 4' long, 3' wide and 2.5' high with a tight-fitting lid. It can hold up to twelve 6-volt batteries. We have a 24 volt system, so the batteries are wired in banks of 4 batteries in series. Then, each bank is wired in parallel with other banks. Right now, we have 8 batteries, so 2 banks of 4. Batteries used for off-the-grid applications are deep-cycle batteries--different from what you use in your car. To start your car, you want a battery that can provide a huge amount of current for a very short time to start the car, then be charged back to full capacity quickly. For an off-the-grid application, you want a battery that can provide a more modest amount of current over a long period of time and use up to 40% to 50% of its capacity before being recharged. The batteries we have now are wet-cell, deep-cycle batteries. That means they need to have distilled water added occasionally. And, that when they charge they give off hydrogen gas. Thus the battery box, which encloses the batteries and is vented to the outside. A small 24V ventilation fan comes on whenever the batteries are being charged, and exhausts any gasses in the box to the outside of the cabin. A critical safety feature! Deep-cycle batteries have a lifetime specified in discharge cycles. A cycle is usually defined as a single discharge to 60% or 50% capacity. Lifetimes can range from 800 or 900 cycles up to 1500 or so cycles. It depends on the battery. And, the more cycles the more expensive the battery. After this number of cycles of discharge and recharge, batteries need to be reconditioned or replaced. Our batteries are about 10 years old. They only cycle when we are there to use electricity. Or, when we are not there and we have several days where they don't charge. (There is electrical use even when we are not there since we leave the propane forced-air heater on and set to 45°F.) Still, they have had many cycles, and some to levels well below 50% or 60% of their capacity. Before we move in full-time, we need to replace the batteries. To follow my research and decision on new batteries, click through to "More..."